Mr Farage wrote in The Telegraph ahead of today’s launch of what was nothing short of a “national humiliation” suffered by the UK at the European Summit, where Prime Minister Theresa May secured yet another delay to Brexit to October 31st, 2019, and lamented of the ineffectual lawmakers in the House of Commons. “The fact is, our ruling class no longer believes in Britain. In them, there is a blithe acceptance of managed decline. “I feel differently. We are a great nation and a great people. But we are being held back by weak leadership. The time to change this is now,” Mr Farage wrote. The Brexiteer, who campaigned for the UK to leave the EU for more than two decades, registered his party in February in preparation for the betrayal of Brexit which would result in the UK needing to take part in European Parliament elections. “We see the next few weeks as the beginning of a fightback against an establishment that has wilfully betrayed our trust,” the MEP wrote. “This is the most ambitious project I have ever launched in my life. If, as I believe, the people want to change politics for good, I am going to give them the opportunity to make that happen,” he added. 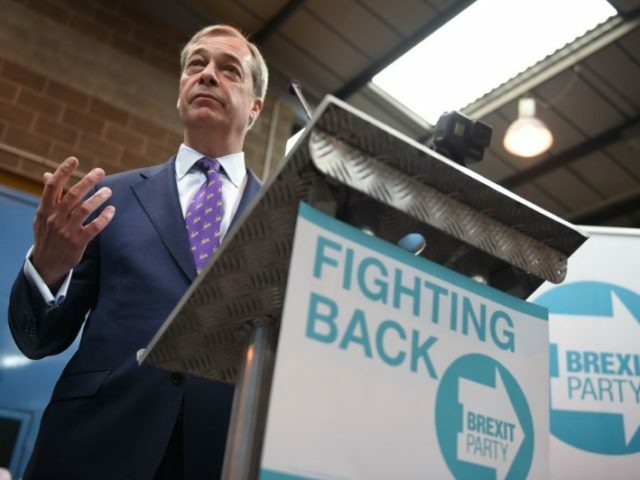 Anti-establishment and eurosceptic parties are set to make gains in the May 23rd to 26th elections, with Open Europe commenting the drop in support for the Tories in a recent poll could be due to the rising popularity of the Brexit Party. Mr Farage introduced fellow Brexit Party candidates, notably the sister of Tory Brexiteer Jacob Rees-Mogg, Annunziata Rees-Mogg. Teacher Dr Alka Sehgal Cuthburt likewise called for the ‘”Redemocratisation” of British politics and has stood for MEP candidate to fight for democracy. MEP Candidate June Mummery called for an end to the Common Fisheries Policy, saying for the years that the UK has been “throwing the jewels from the crown” as Europeans continue to be allowed to fish in British waters. “It’s time we took on the establishment and the civil service” to make British politics work “for the people” again, Mr Tice said, warning that by the time Halloween comes around, the Government will write another “begging letter” to the EU to delay Brexit even further. A playback of the launch and a liveblog can be read below this article. This liveblog of the Brexit Party launch is now closed, but see below for real-time updates. UPDATE 12:12 — Farage on the so-called Irish ‘hard border’: Who’s going to build that hard border? Not the UK or Ireland. Farage laughed off the scare tactics that a WTO exit would result in a ‘hard border’ saying, “who’s going to build that border”? with Mr Tice pointing out that technology can be used for customs purposes. UPDATE 11:45 — MEP Candidate Richard Tice says “we cannot allow this shambles in Westminster to continue. “We cannot allow this shambles in Westminster cannot continue,” the Brexit Party chairman said, adding, “We have an incompetent government, an incapable negotiating team, and politicians who write one thing in a manifesto then conspire in dodgy backroom deals” to undermine Brexit. The Brexit Party is going to do things differently,” Mr Tice continued. “It’s time we took on the establishment and the civil service” to make British politics work “for the people” again, otherwise by the time Halloween comes around, the Government will write another “begging letter” to the EU to delay Brexit even further. “The question of democracy is central. It’s taken society centuries to go from being ruled by taboos, to monarchs who rule by divine right, to social democratic forms of governments which are based on majority vote where they get their legitimacy from their citizens for democratic mandates,” the academic explained. “Since the referendum, we’ve seen even as an ideal that principle of democracy is so weak it doesn’t even exist any more. “That has had ramification throughout our lives where our institutional structures have been recast away from democratic principles to technocratic boundaries,” Dr Sehgal Cuthburt added, and called for the “redemocratisation” of the UK which can only happen through the people. Dr Alka Sehgal Cuthburt is a researcher, author, academic and educator. She is standing for The Brexit Party to stand up for democracy. The managing director of Lowestoft fish market auctioneers BFP Eastern and veteran Brexiteer, Ms Mummery said the UK must stop “throwing the jewels from the crown” and end the fisheries policy that allows Europeans to fish in British waters., tearing up the policy document on stage. June Mummery is our next candidate. She has fought for years for our fishing industry to be independent of the EU. UPDATE 11:30 — Brexit Party candidate Ben Habib calls it ‘Bonkers’ to take no-deal off the table. Our next candidate is Brexiteer business person Ben Habib @benhabib6. UPDATE 11:22 — Tory MP Jacob Rees-Mogg’s sister Annunziata Rees-Mogg reveals she is standing as an MEP candidate for the Brexit Party. “We should stand up and fight for our future but we should trust the people… We have got to rescue our democracy, and show that people have a say in how this country is run. Politicians are not our masters, but do our bidding,” she affirmed. The EU elections will be held on 23rd May. Our first candidate to be announced is @zatzi Annunziata Rees-Mogg! UPDATE 11:15 — Farage: Our democratic decision is being wilfully overturned. “Our democratic decision is being wilfully overturned in the country that once had the mother of parliaments,” the Brexit Party leader said. “What I am fighting for now is a democratic revolution in British politics,” he added.